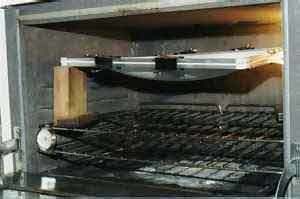 5. a method of holding your frame and material off of the oven rack while heating. On the left is a picture of my smaller forming box. The outside dimensions of the box are 230mm x 280mm and it’s approximately 75mm deep. The size of the box is really unlimited so long as your source of vacuum has enough capacity to evacuate the box quickly. Mine is constructed of 18mm MDF (Medium Density Fibreboard) but plywood or particleboard, etc. will work just fine. The forming bed of the box is 6mm pegboard. The box needs to be as air tight as possible so silicone sealer is used in all corners and for attaching the pegboard for a tight seal. Also visible is the hole for inserting the vacuum hose. This is just a slip fit but it must be a good one so cut accurately. I also have a larger 300mm x 400mm forming box but have not found much use for it as of yet as the small one is adequate for most scale details. Just for reference, a small 1-gallon shop-vac is sufficient for the small box but inadequate for the larger one. However, a regular shop-vac works fine with the larger box. All in all very simple, no voodoo here. There is not much more I can say about the vacuum source. A shop-vac is not the only way but it works well and I had one available. There are other, better sources of vacuum but I have not experimented with any as of yet so can’t comment. For more on this subject I recommend the book listed at the end of this post. Next item is the frame for holding your material to be formed while you heat it and form it. I make mine from aluminum angle stock available at most hardware stores. Bend to the proper size and pop rivet or nut and bolt the last corner to hold it all together. The three frames shown below all work with the 230mm x 280mm box depending on the size of the part I’m forming. One is slightly larger than the box, one is the same size as the top of the box, and one is much smaller for those really small parts. When using a frame smaller than the box itself you must tape off the unused portion of the forming bed so that a seal can be formed by the hot plastic. As stated above, I use the oven in my home to heat the plastic. I have had no problems other than the hot plastic does not leave a family friendly odor. I try to do my forming when the wife and kids are out! It may not hurt to open a window or something also although the smell is not nearly as bad as some other hobby products we use nor does it linger for too long. 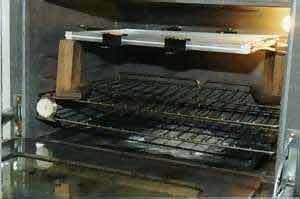 The plastic, in its frame, placed on the wooden supports in the oven. The temperature was set to 150″C and the plastic left in for about 90 secs. The right amount of droop is the key to vacuum forming success. The plastic was allowed to droop before being placed on the plywood pattern and the vacuum cleaner turned on. some aluminum cake pans I had on hand. The cake pans allow for a couple of inches of sag, which is more than adequate for the size sheets I normally work with. You do not want to allow the heated plastic to sag far enough to touch anything or it will stick and ruin the sheet. If this does happen, allow the sheet to cool and it will generally pop right off of whatever it is stuck to. Below is a pic of my frame with a sheet of plastic clamped to it and set on the appropriate sized cake pan. Notice I use small clips to hold the plastic to the frame. Make sure you have enough to securely hold the plastic while it is stretching. Also, make sure the clamps do not interfere with the forming bed so much as to prevent the hot plastic from forming an airtight seal. Ok, let’s form a part. Once it begins to sag it is ready to form although different materials and thickness will require different amounts of sag. If you form to soon you run the risk of the plastic cooling before the part is completely formed. Wait too long and it may tear or, most aggravating, it is prone to forming webs. Webs occur when the hot plastic folds onto itself in which case it will not form properly around the mold. I have found no way other than trial and error for getting the hang of how much sag is required. Once the plastic is ready quickly turn the vacuum on (make sure it is within quick reach!). Using your gloves, grasp the frame on either side of the material with both hands and remove it from the oven. Quickly position it over the vacuum box making sure it will cover the forming surface. Keeping the frame as level as possible thrust it down over the mold. It is best, especially with tall parts such as a spinner, to push the hot plastic over the mold very quickly. This creates a seal and forms the part almost instantaneously, which helps to prevent webs from forming. It is better to use a generous size frame and material and make sure you cover the entire forming surface of the box. You will end up with some waste but the plastic is fairly cheap and gives you some room for error when aiming to cover the box. The spinner here is 112mm in diameter and about 100mm deep. This particular one was formed from .75mm styrene, which is adequate, but 1 mm would have been better. This is another area where experimentation is needed in order to gain experience at judging what material thickness is best suited to your part. That is a basic introduction although, admittedly, it barely scratches the surface. As time permits I will post additional information if the interest is here. Namely, there is much to be said about making your molds to allow for the best forming. 1. Have you tried this method with clear plastic (for canopies).? Yes I have done clear parts and they are a bit more involved. The plug has to be much, much better for doing clear parts as any imperfections are readily visible in a clear part. There was an article in RCM on a method for doing clear parts that I have not tried but I want to. I will give it a shot and do another post on it as time permits. 2. Do you add to the bottom of the plug to give extra material for cutting and finishing of the formed part? Yes again. Probably 90 percent of what I do needs to have a “pedestal” of some type to block the part up off of the forming bed. I will try and post some pics of some of my plugs in the next day or two showing this. 3. Do you lubricate the plug to ease the sliding during forming, if so, with what? Occasionally I do lubricate the plug, usually with vegetable oil or similar. A very thin layer is all that is necessary. Mostly it depends on what the plug is made from and what kind of plastic is being formed. Some of the plastics are more “sticky” than others. I try to make my plugs from materials that do not need any type of finish as the plastic is very prone to sticking to any type of paint or primer. You cannot use lubricant with clear parts at all as it creates imperfections that will show up (even though they are invisible on opaque parts). Honestly, I have not tried too many different types of lubricant so there may be some that I’m unaware of. For example, I’ve not yet tried mold release or wax but I have some on hand and may run some expirements.